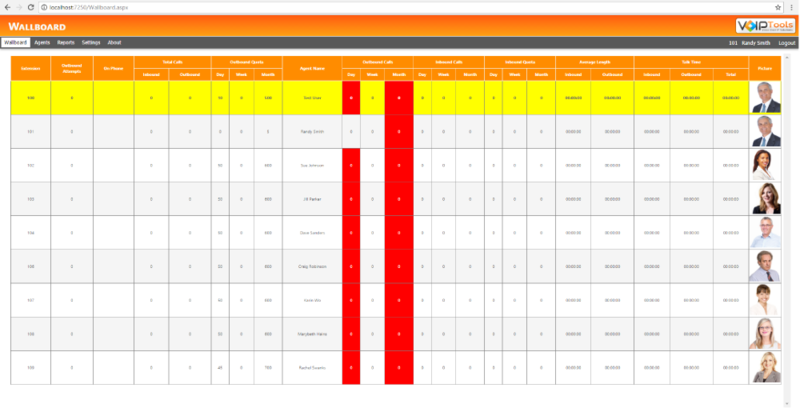 Now you can monitor the activities of your inbound / outbound call center with 3CX Competitive Wallboard. This web application allows managers and agents to view in real-time each agent's performance and whether they have met their weekly and monthly call quota. 3CX's standard wallboard is great for tracking basic statistics, but our customers wanted more! So we created our "Competitive" or "Enhanced" Wallboard that tracks much more information and tracks inbound AND outbound statistics. Please take a close look at our Wallboard and see just how amazing it can be for your business or organization! Set specific call quotas for each agent. You can create daily, weekly, and monthly call quotas! Very quickly and easily track your specified agent statistics in REAL TIME! Managers can simply choose which statistics to display on the wallboard, and which to not display! 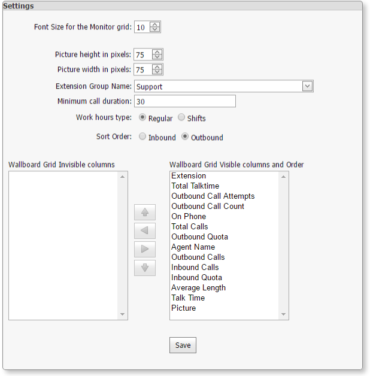 VoIPTools Enhanced (competitive) Wallboard for 3CX can track inbound AND outbound call stats! Display the Wallboard on a large screen in your call center, or only allow managers to view the Wallboard! VoIPTools Wallboard will continue to gain more and more features, but will ALWAYS be simple to use! Managers and Agents alike can see who has made the most calls, and which agents have met their call quotas for the week and month. Have a sales center? Increase sales with your new Wallboard by motivating agents to be more productive, and by tracking statistics. Because Manager and Agents can see specified call statistics, it's extremely easy to see who is performing well, and who isn't. Motivating your outbound call center staff just got a little easier with 3CX Competitive Wallboard. Now Managers and Agents alike can see who has made the most calls, and which agents have met their call quota for the week and month. 3CX Competitive Wallboard is a web application that can be accessed easily from any web browser. It displays a picture of each agent, with various call statistics, in a grid. Agents who are high producers display at the top, while lower producing agents display at the bottom. As agents place calls, their position changes on the wallboard in real-time. As a web application you can display the agent information on flat screen TVs in prominent locations easily visible to everyone, or you can choose to limit access to the wallboard to only managers. How does the walboard help? Gamification of your outbound call center can help motivate your staff by creating a competitive environment. Agents can see a prominently placed wallboard that shows where they stand in comparison to their peers. Agents at the top of the wallboard have bragging rights that they have produced the most, while other agents try to dethrone the top ranked producer by being more productive. For staff who are lower on the wallboard, or who have not met their quotas, they know their manager and coworkers can easily see who is performing well, and who needs to produce more. It’s a great tool for monitoring staff performance while encouraging a friendly competitive environment. How do I install the Wallboard? We will give you a download link and license key after purchase. You can simply go through our simple installer! May I see a demo of the Wallboard in action? Can I just purchase this Wallboard individually? When you purchase "VoIPTools", you automatically gain access to ALL our products and it is already priced the same as one single product! We want to make it impossible to say no to using VoIPTools! VoIPTools is a MUST HAVE for ANY organization. It's a no-brainer! Whether through one of our commercial products, or a custom solution built to meet your specific needs, we can help you get the most out of your 3CX investment. Call us today!